A couple years ago I set up this application on my gmail account that sends me daily emails about articles that come out online about Guatemala. Usually they’re pretty uneventful news, and sometimes it’s an article about something completely off topic, but the writer happened to throw Guatemala in there somehow. It was helpful, however, when I was writing my research paper for my International Law class on the Commission Against Impunity in Guatemala (CICIG), since I got updates about anything it was involved in and was able to incorporate them into my paper. Today I opened the email thinking it would be just as uneventful as the weeks before, but I was sadly disappointed. There were several snippets about the vigilante justice that has been mounting in Guatemala. This isn’t something new over there, but it seems to be escalating at alarming rates. I remember when Jeff and I were in Guate for Christmas in 2007, he saw a magazine article where two men had been caught (I forget what for), and the town made them fight each other for their lives…so one of them ended up killing the other, with the whole town watching and cheering. Jeff was shocked, but all my Guatemalan friends who were hanging out were immune to such [common] reports. I’m sure most people in the United States are wondering what would make ordinary citizens take up action and become so violent and aggressive. The BBC recently reported on the bus driver extortion scheme that has been going on in Guatemala for quite some time now. Basically, gangs threaten bus drivers by making them pay a monthly “protection” fee, in exchange for not killing them. What this means is that gang members are pulling up to buses with dozens of innocent people, kill the bus driver, and then either drive off or try to rob a couple of the people on the bus while they’re at it. Not necessarily something you want to see on your daily commute to work. The problem with this is that no one is really stopping them. The government makes half hearted attempts that end up being more of a hassle than actually providing a solution to the problem. An example of this was the fairly recent enactment of a new motorcycle law. It appears that most murders being committed where being done by two individuals on a motorcycle: one would drive, the other one would shoot. So they enacted a law that only one person was allowed on a motorcycle. You can imagine how helpful that was. People who are in the business of constantly breaking the law and murdering people are not going to be held back by meager traffic laws. 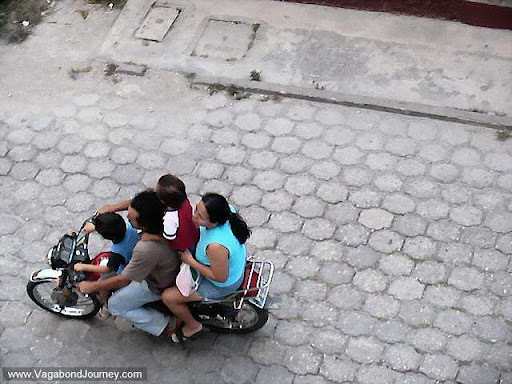 The worst part about this law was the inconvenience it caused people: motorcycles are a huge mode of transportation in Guatemala, with whole families being taken to work/school on a single motorcycle. Other than that, not much has been done to alleviate the situation. I haven’t heard of any sound legislation or changes to the system to catch the gang members responsible. In reality, many of the crimes in Guatemala go without ever being investigated or any action taken to find and punish those responsible (about 98% actually, if you can believe that). It’s this inaction that leads ordinary citizens to take action into their own hands. NPR published an article detailing some of the recent acts of vigilantism, and the opinions of those who now feel safer in their towns because of it.